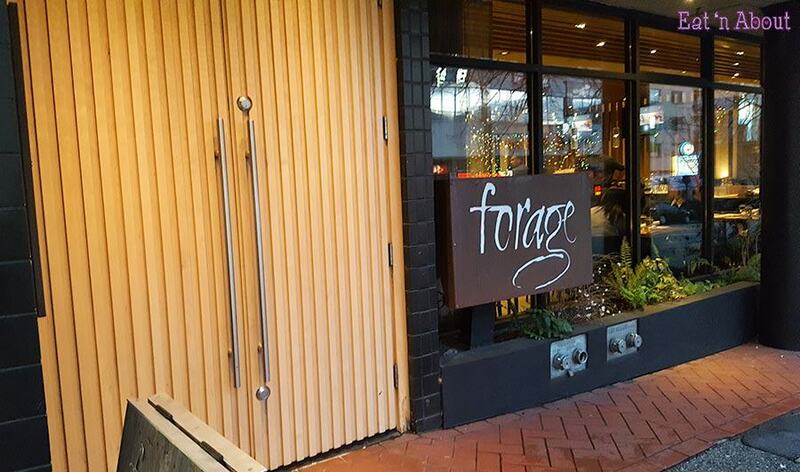 For my last Dine Out of the year we picked a $30 menu and decided on Forage. This is not my first Forage rodeo but it was my first dine out with them. First a note about the service though- As it was dine out, we were restricted to a 1.5 hour dining period…this was drilled into us both in the reservation confirmation message and again with our server. Our service was very rushed and made it a little difficult to fully appreciate the food. 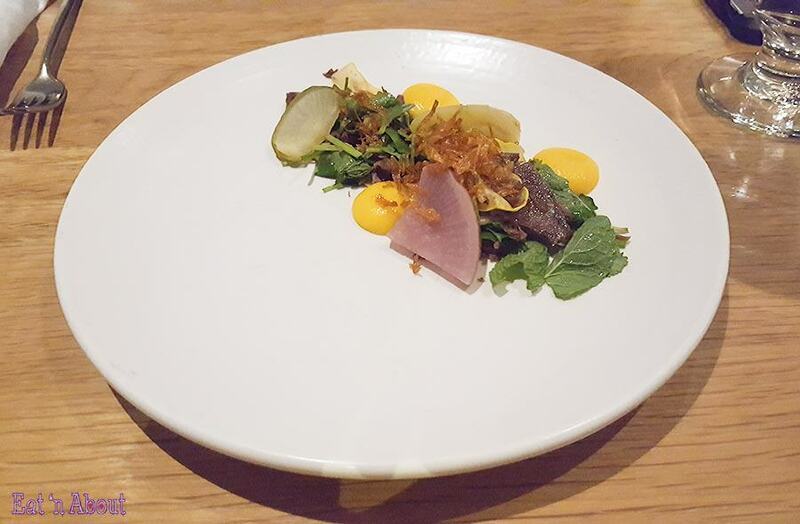 Forage was the only restaurant out of my 3 dine out experiences this year to make me feel this way and I must say it had put a damper on my Forage experience as a whole. As usual AngryRussian and I ordered different things but in reality we’re sharing everything! Overall the “Vietnamese Style” Bison Shank Salad was quite good. The mixture of cilantro and mint and chilies were very aromatic. There were only 2 small thin slices of bison shank though and I was disappointed because that didn’t give us a chance to taste the bison. The braised daikon was quite bland. The Grilled Humboldt Squid was delicious. 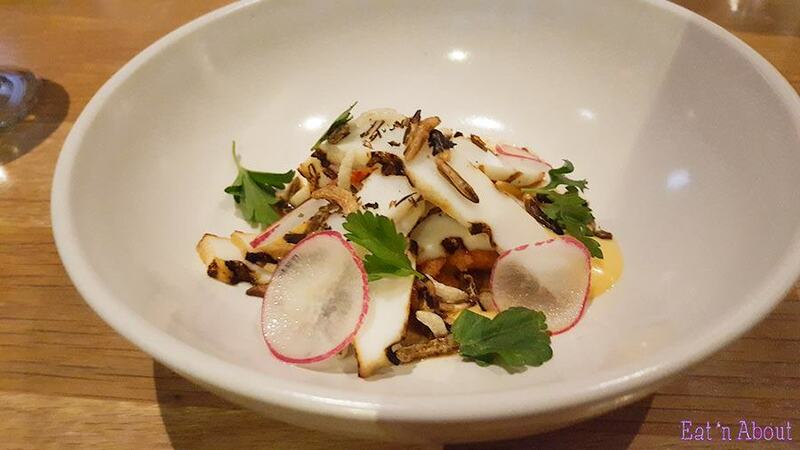 The squid was tender and flavorful and the puffed wild rice was crispy and also quite aromatic. Bitefuls with the radish kimchi was delightful. 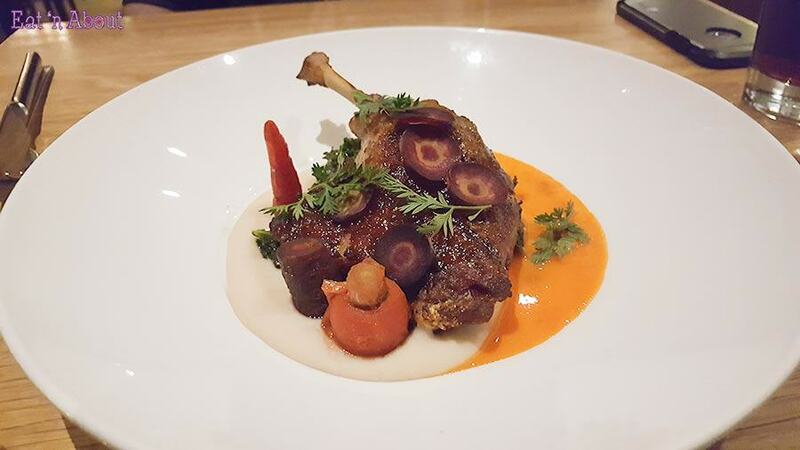 The Harissa Grilled Duck Leg wasn’t as big as Wildebeest’s but it tasted better. The fat on the duck leg was rendered perfectly and the meat was moist and flavorful. The white bean puree was such a good idea in place of the usual cassoulet that is a common accompaniment to duck legs. This whole dish was in general very enjoyable. Crispy Halibut Cheeks was more subdued in flavor but the texture and natural flavor of the halibut cheeks made up for that. Each piece was subtly salted and the crispy parts were crisp and not soggy! 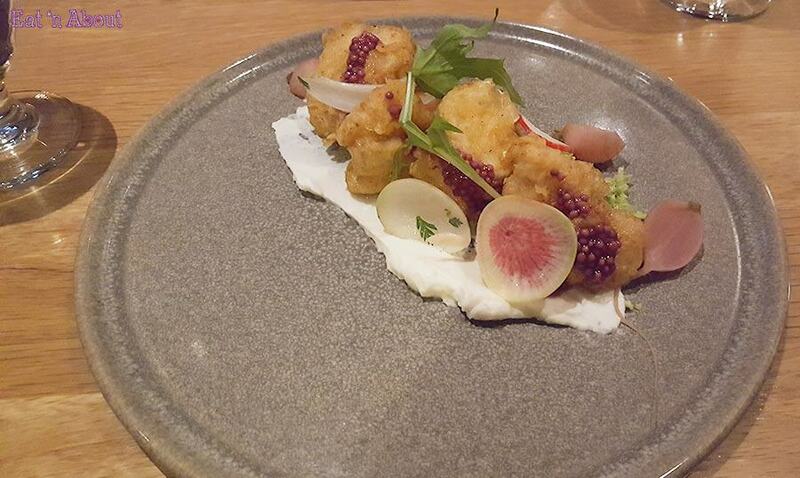 The Elderflower Cheese Puff was pretty amazing. 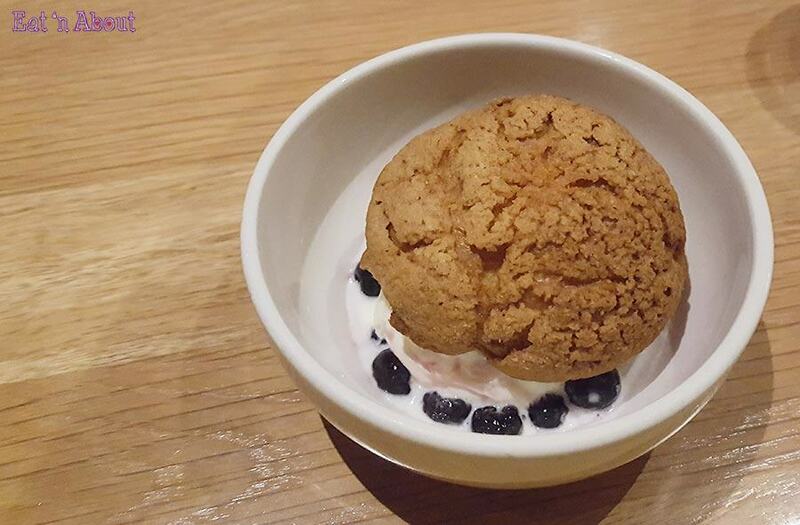 It’s like a cream cheese cream puff. The pastry part reminds me of Beta5’s in its looks and texture, but it was really hard though I had to use my fingers to hold it still while I stabbed at it with my spoon. But once I got through it was amazing. I could clearly taste the floral notes of elderflower and the bites of everything together were creamy and sweet and cheesy. I could have seconds. 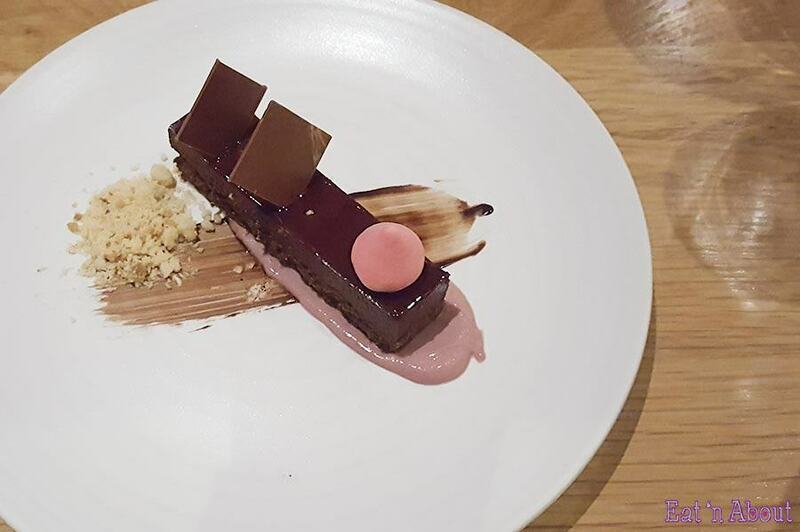 The Chocolate Cherry Bar was your standard silky chocolate ganache cake. I like the white chocolate cherry cream as it added something different to just chocolate. The cherry flavored marshmellow was cute and chewy. Again, I was never a chocolate dessert fan so that’s all I have to say about this. Well folks this is the last week of Dine Out Vancouver of 2018 and hopefully everyone got a chance to try at least one restaurant! Some of the more popular ones were sold out quite early so maybe next year I’ll be more on the ball with the reservations.